Hawkesbury Trainer Will Be "Disappointed If She Doesn't Win"
Hawkesbury trainer Scott Singleton is unconcerned that his promising mare Stock Up ($3.10 on TAB fixed odds) has missed lead-up trials to her resumption on her home track on Thursday. The New Zealand-bred four-year-old begins a new campaign in the Coca-Cola Amatil Maiden Handicap (1300m), and he has gone to great lengths in preparing her for a first-up assignment. 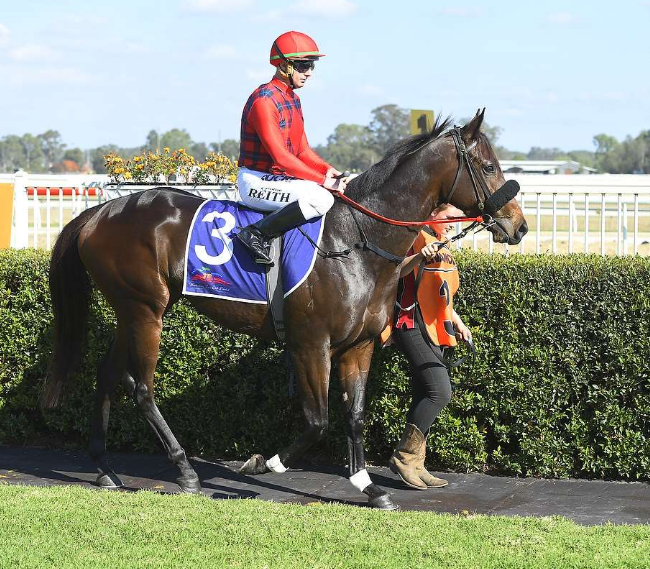 Placed second at three (including one at Rosehill in April when subsequent Queensland Oaks winner Youngstar ran third) of seven starts, Stock Up hasn’t raced since chasing home Toroso (who won again a month later) in a 1500m Maiden at Hawkesbury on May 24. “Circumstances worked against us in not being able to trial her before tomorrow’s race,” Singleton said this morning. “She was balloted out twice from Sydney trials and then the trials at home last Monday week were called off because of the wet weather. “But I’m not really concerned. Stock Up has had a 1000m jump out on the Polytrack at Hawkesbury and I took her on a long float trip to the beach at Mascot to get the nerves out of her. "Her work has been good and she is ready to go. Christian Reith continues his association with Stock Up, having partnered her in all seven starts so far. She has not finished further back than fifth and certainly deserves a breakthrough. Singleton also considers his other Hawkesbury representative Lexi’s Choice (Jess Taylor, $13) can run well in the Forever Gleam Provincial & Country Maiden Plate (1300m). Singleton has taken a nose roll off Lexi’s Choice for her return, and instead is using winkers and ear muffs (pre-race only). Hawkesbury-trained dual acceptors Sebring Bay (Jason Attard, $7.50) and Celebrator (Brooke Somers, $11) have been withdrawn from Stock Up’s race (reducing the field to eight) and will line up against Lexi’s Choice. Attard has made a number of gear changes with Sebring Bay (apprentice Sam Weatherley), and another Hawkesbury runner, the Wade Slinkard-trained Banjo’s Voice (Winona Costin, $5.50), who has been well backed at both runs this preparation, goes minus blinkers. Fellow Hawkesbury trainer Garry White has given experienced jockey Adrian “Mouse” Robinson, making another riding comeback, a chance to break back into the provincial winning list. White has booked Robinson for Paris In May ($12) in the Arcadia Entertainment Maiden Handicap (1000m). The superbly-bred Duporth four-year-old (out of Danehill mare Danebeam, a daughter of multiple Group 1 winning mare Slight Chance) finished a close second in a Rosehill 1030m trial on October 2, with Corey Brown aboard. White gave Robinson his first ride back this season when he finished third on Another Shadow at Orange on October 15. He then took four rides at the Narromine TAB fixture last Saturday and scored on $21 chance Poppy’s Freckle for Dubbo trainer Clint Lundholm. Robinson, who had only four rides without success last season but won three races the previous season on Hurricane Harbour for another Hawkesbury trainer Mitch Newman, has tallied 10 Group and Listed victories – including a Group 1 on Mr Bureaucrat in the 2002 Doomben Cup. The rail is in the TRUE position for tomorrow’s meeting, and the track earlier this morning was rated a 'Soft 7' with a penetrometer reading of 5.22. RACE 1: BELLE OF CLONMEL, Evict, Magnolia Power. RACE 2: SHOUSON, Show Me The Honey, Chamfer. RACE 3: LADIES’ GEM, Stock Up, Time Of Glory. RACE 4: WILD KINGDOM, Wriggles, Our Celtic Star. RACE 5: NATALIA, Excelling, Jexerlent. RACE 6: MERICAN, Saintly Sunrise, Down Stage. RACE 7: SEGALAS, D’Oro Rain, Cuban Sizzle. RACE 8: GODUNOV, On Angels Wings, Devil’s Lair.